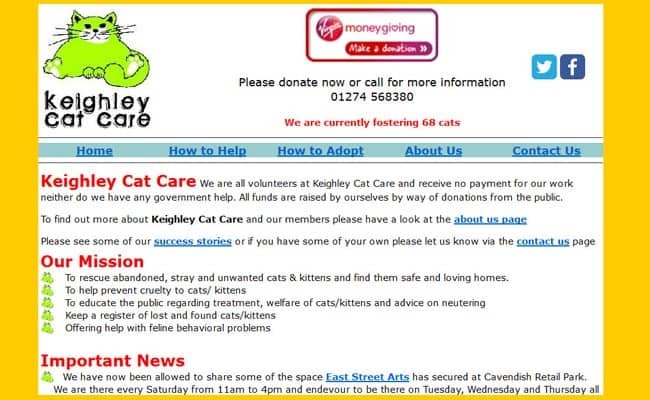 Keighley Cat Care, Bingley – Keighley Cat Care is based in Bingley, Yorkshire. Cats and kittens come in to us for many reasons, some abandoned, some dumped in dustbins, cardboard boxes or thrown out of cars. All the cats and kittens are taken into foster homes. They are given a thorough examination by a vet and any illness, injury etc is treated immediately. They are given flea and worm treatment and vaccinated. The ones old enough are neutered. We also microchip them. They will then stay with us until an appropriate new home is found.